I want to see this band live. That's all I can say. Actually, that's not all I can say, but that's my first impression after listening to this disc. If the CD can convey this much energy and passion and leave me this absolutely breathless, their live shows must cause coronaries and epileptic fits on a regular basis. And that's exactly what I'm into right now-near-death experiences. Here's another thing I can say - it is so nice to get a CD in the mail with such an awesome physical presentation (artwork, disc title, band name, etc) and have them live up to my starry-eyed expectations. Too much of this stuff ends up being just noisy, monotonous heavy metal with stupid lyrics sung by greasy-haired, overweight men that secretly long to do high school all over again. 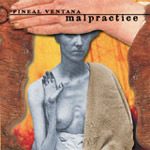 "Malpractice," however, is loaded with awesome sax paired with an incredible rhythm and guitar section-imagine Lydia Lunch ("Teen-Age Jesus..." era) making an attempt to be musical along with the noise, without compromising any of the electricity.